Ray and Wilma Yoder set the record over the course of their 40 years together. Who doesn't love Cracker Barrel? (Honestly, those dumplings. Yum.) 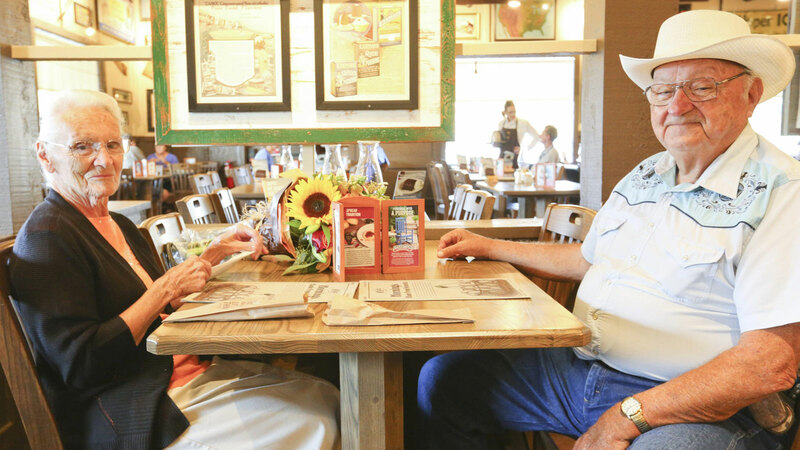 But one couple seems to love the country food-themed chain more than most: Ray and Wilma Yoder, a husband and wife who hail from Goshen, Indiana, have visited every Cracker Barrel in America. There are 645 restaurants in 44 states, and as of today, they've visited them all. It took the pair 40 years to establish the new record. With today's trip to Cracker Barrel's first West Coast location in Tualatin, Oregon, the Yoders completed their mission, according to an email received by Food & Wine from a Cracker Barrel representative. The Yoders walked into the restaurant to the cheers of employees and guests, who knew the couple was about to set a chain record. For their effort, they were awarded two Cracker Barrel aprons—gifts that doubled as Ray Yoder's birthday present from the brand. Ray Yoder turned 81 years old today. According to ABC News, Ray began his epic quest to conquer—or, at least, dine at—every Cracker Barrel back in the 1960s, when he worked as an RV driver. "I've not had a bad experience anytime," he said. Why Cracker Barrel and not any other food joint? "They were always along the main interstate, so you'd have to have your eyes closed to miss them," he explained. And soon, Wilma Yoder decided to join her husband. They don't always spend a lot of money at each stop. But, "we don't drive in the parking lot and say, 'Now we're here,'" Ray Yoder told ABC News. "We go in a spend a little of money. We're not rich but we'll buy a coffee to go or a little bit of candy." For its part, it seems Cracker Barrel couldn't be more pleased with the couple's patronage. "[The Yoders] have touched the hearts of Cracker Barrel employees across the country," reads a statement from the restaurant chain. "We are thankful to have served them so many times over the years and honored to have been a part of many happy memories they have shared during their 60 years together."